I wrote this article below some time ago but never got to publish it but it still has some relevance to day. I didn’t publish it before as I should have as I was heading to Australia for a week and felt it needed ‘something more’. Pick it up after this first paragraph that deals with todays news. And so it actually is happening, the summit between Kim and Trump is under way, the historic handshake was shook and all the pictures have been taken. Flanked by his security guards Pompeo and Bolton the two have met again for a ‘working lunch’ after initially meeting alone with just interpreters present. Trump claims they have a ‘great relationship’. We will see. Kim is vulnerable as his country has suffered immensely from the economic warfare that the U.S has imposed via sanctions on North Korea, because they can, as owners of the global financial system. These are cruel and devastating sanctions as they cut the ability to trade as a nation and earn from trade with other countries, including New Zealand where just last week it was revealed that Pacific Aerospace based in Hamilton was fined $75,000.00 and forced to grovel to a dutiful judge delivering for his global masters for exporting aircraft components to North Korea. Time will tell just how the prestitute media portray the meeting and whether Kim can hold out agaisnt a formidable trio of hardliners, one with an ego so great that as we saw for the G7 Summit shows he doesn’t care what anyone else thinks, he alone is right. Lets hope Kim extracts a U.S. withdrawal of troops and military from South Korea as part of any deal, that will be hard to achieve. At the very least there should be a peace treaty signed as the two countries are still technically at war. It will be exasperating for followers of this news to hear our media continue to push the ‘rogue state’ line and make out that Trump is the king of ‘deal makers’ forgetting that as the Iranians warn it is the U.S. that backs out of treaties and committments when there is so much at stake. Perhaps the reporters have to trivialise everything in an attempt to gain some level of undertanding of what the issues really are. The prospects for peace diplomacy between the US and North Korea took a sudden hit after President Donald Trump issued an extraordinary threat to Kim Jong Un. It was in effect a death threat. Trump warned last week that if the North Korean leader does not comply with Washington’s demands for complete denuclearization, then Kim would “end up like Gaddafi”, an acknowledgement that indeed it was the U.S. that structured the overthrow and murder of Colonel Gadaffi plunging the once North African jewell state, Libya, into a failed state status overrun by terrorist rebels. Trump added that North Korea would be “decimated” if it did not give up its nuclear weapons. Of course Trumps rhetoric of violence against another state is against International Law and the United Nations charter but it’s not the first time that the American President has engaged in criminal intimidation of the northeast Asian nation. Last September he told the UN General Assembly that North Korea would be ‘completely destroyed’ and yet nothing happened, no rebuke or sanction. Yet US Media that directly feeds our New Zealand media are spinning the lie that the devious ‘rogue state’ is backtracking ‘in typical fashion’ from negotiations and on it’s commitments to the peace process initiated by the peace loving Nobel Award nominee President Trump. Our media are ignoring the glaringly obvious fact that Washington is holding a gun to Kims head, making him a Mafia style offer that he ‘can’t refuse‘. All of a sudden the much anticipated summit between Trump and Kim scheduled for 12 June in Singapore is thrown into doubt. North Korean state media has cautioned that the meeting will be cancelled if the U.S. insists on unilateral nuclear disarmament by Pyongyang. Of course there is more than one reason why Kim should be wary of the American stance. Not only was it that Trumps recent appointee, hard-liner John Bolton of George W Bush era fame, to position of National Security adviser referring to the ‘Libya model’ for how Trump should be treating the negotiations with Kim that threw the summit into question. The other development was the U.S. continuing to proceed with the ‘Max thunder’ military drills with the subordinate South Koreans right on the border with the North involving war planes and ships that look scaringly like preparing for an invasion of the North. Nothing like a conciliatory action before historic peace negotiations. Trumps keenness for the historic summit is not about seeking a mutual peace agreement. 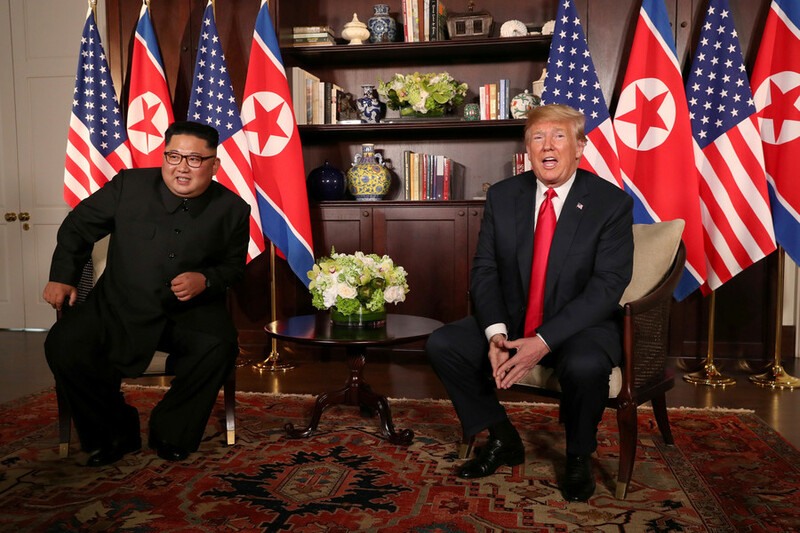 Its more about a globally televised handshake with Kim and the vain advancement of his claims that he deserves to be a Nobel Peace Prize recipient. His ego is what it is all about and his reality television thirst for ratings is how he will judge his success. Any summit discussion so far avoids the reality that for the U.S. and all its neocon hardliners in Washington the real reason why the Americans are seeking ‘peace’ with the North Koreans is that for the first time there is a country that could potentially threaten the U.S. mainland on similar terms. Imagine pushing so hard on the North by ramping up accusations, false claims and provocations that a misinterpreted threat results in Los Angeles becoming a smouldering ruin. The extreme threatening U.S. policy now threatens to engulf Iran as well with a series of blatant lies being manufactured to blame Iran for all woes in the middle east, whilst ignoring their own invasion of Syria but in any event Americas store of armaments in the South of the Korean peninsula is all about containing China, its biggest threat to ongoing global hegemony. Beneath the superficial diplomacy, Washingtons agenda is for the North Koreans to completely submit and surrender to Uncle Sam, as did once a trusting Colonel Gaddafi. Kim Jong -Un would be very wise to take note of that recent history of what happened in Libya. Telling North Korea to ‘negotiate or else’ is holding a gun to its head. No nation with any self respect would comply. If Kim Jong-Un holds fast our media will go ballistic with an anti North Korean rampage of accusations and false stories that make them out to be the most vile country on the planet. All they want is peace with the South and a united Korea.